frankly my dear...: What i am doing - In March. What i am doing - In March. :: making rolled fabric flowers using this tutorial - lots of fun! :: hoping Scarlett will start walking soon - there's pretty dresses to be worn! :: opening the letterbox.....nope still no happy mail!! :: giggling at Amity thinking her friend lives in America, because she can't understand her properly when she speaks! ﻿I've been slack with my posts lately, i know. But i've been busy chasing a little one year old around - boy i'd forgotten how much toddlers keep you on your toes! She's into everything at the moment. As i mentioned above, i've also been cross-stitching - i was sorting through some stuff the other day & came across this project i started almost seven years ago. I was nearly due to have Chas when i began it & then when he was born, well.........cross-stitch got shoved into a cupboard & forgotten about! Now, three kids later, i'm giving it another go - i don't care that cross-stitch may be 'dorky', i'm really enjoying it. I find sitting with a needle & thread very relaxing. What about you? What have you been up to? 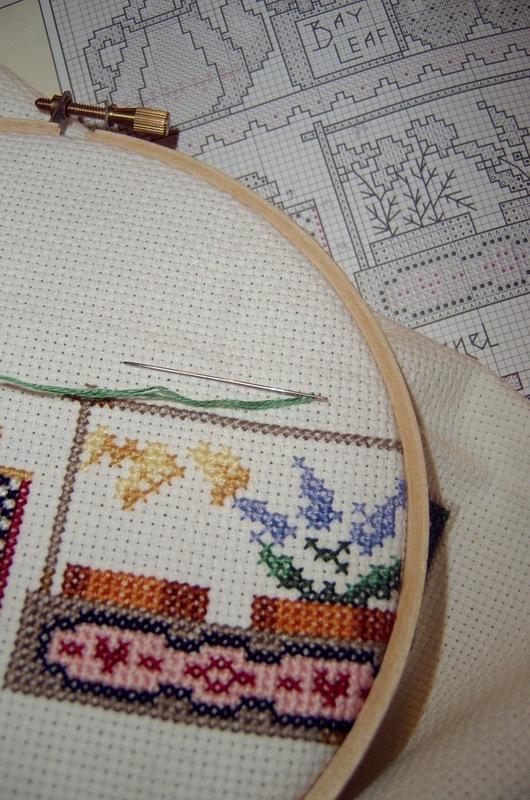 oh no, cross stitching is not 'dorky' and if it helps you relax, all the better. Oh my I love the link for the rolled fabric flowers! I can't wait to made some! Fab, thank you! Four Happy things on Friday. From the Patch - Spinach/Silverbeet.